Gmail Does A Body Good | OhGizmo! I’ve been using Gmail since the beta first started back in 2004 and I’ve never really turned back. I think that in the entire four years that I’ve used it, I’ve only had maybe a dozen pieces of spam make it to my inbox, and not a single legit email in my spam box. I’ve even set up another account which I’ll route mail from other places so it can essentially scrub out the spam. Naturally I’ve thought that if Gmail is so good at scrubbing my inbox clean, why not use it to scrub my body clean? Okay, so I haven’t really thought that in the past, but it’s apparently something that’s possible. This strange bar of soap was apparently discovered in Russia. I can’t read Russian, but it translates to “the purest soap.” Somehow I doubt that this is a real product, probably something crafted by someone with a sense of humor. Either way, I wouldn’t mind having a bar of this sitting in my bathroom. It gets weirder. I found a video that shows someone randomly cleaning the floor of a russian subway train with a bar of gmail soap. I still dont get it! I can shed some light on this. 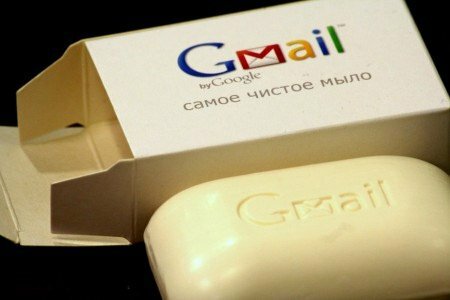 The slang word for e-mail in Russian is “milo” which translates to soap in English. Is it just me or do the first and half of the second word spell “Camoe Toe” ?! The translation is “the cleanest soap” which is “the cleanest (spam-free) mail” in russian slang. shows you how fruitful it is for the marketing if you associate yourself with Google. It`s a russian slang, the word “??? ?” which means soap sounds similar to english word mail.